Fighters featured on the December 19 HBO Boxing After Dark and HBO Latino shows shared their final thoughts ahead of Saturdays fights at the final press conference today at Turning Stone Resort Casino in Verona, New York. Former heavyweight world title contender Bryant “By – By” Jennings (19-1, 10 KOs) of Philadelphia was joined at the final press conference by his opponent Cuban heavyweight Luis “The Real King Kong” Ortiz (23-0, 20 KOs), who will clash in the main event on the HBO Boxing After Dark telecast on Saturday for the WBA Interim Heavyweight World Title. 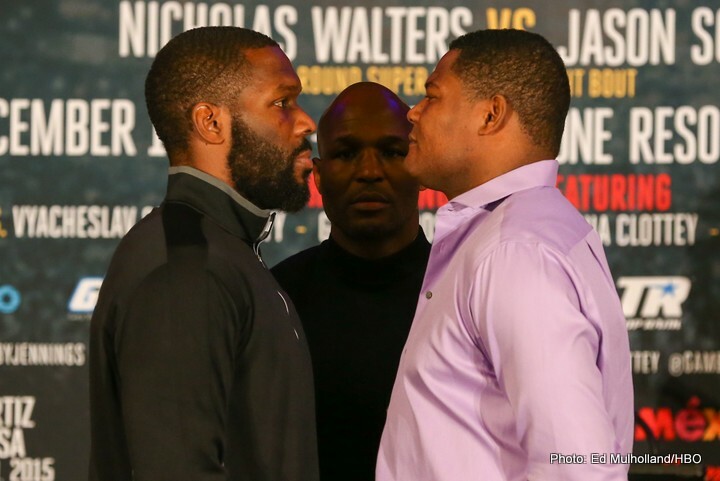 Jennings and Ortiz were joined by co-main event fighters former WBA Featherweight and Super Featherweight World Champion Nicholas “Axe Man” Walters (26-0, 21 KOs and Jason Sosa (18-1-3, 14 KOs) who will battle Saturday in a 10-round super featherweight fight. Also at today’s press conference were HBO Latino Boxing main event fighters Yuneski Gonzalez (16-1, 12 KOs) and Vyacheslav “Lion Heart – Chigonsky” Shabranskyy (14-0, 12 KOs) who will fight a 10-round light heavyweight bout; HBO Latino Boxing co-main event fighters “King” Gabriel Rosado (21-9, 13 KOs) and former IBF Welterweight World Champion Joshua “Grand Master” Clottey (39-5, 22 KOs) who will battle in a 10-round middleweight bout; and former WBA and IBF Featherweight World Champion Yuriorkis Gamboa (24-1, 17 KOs) and opponent Hylon Williams Jr. (16-1-1, 3 KOs) who will open up the HBO Latino Boxing broadcast in a 10-round lightweight bout. “I have worked very hard to be here, and I will not waste this opportunity. We will see on Saturday who is the best. “To make the best fights you need to have great partners getting together that will make fair deals. “Thank you to Turning Stone Resort casino for hosting this event and to Gary Shaw Productions for making this event happen. “Thank you to team Jennings, and to Bryant for being part of this team. Saturday, you’ll see. We will prove that we are the best. “Bryant has worked hard this is what he wants and what he desires. He will be the heavyweight world champion of the world. “Camp has been going well. We have been in camp for than more than a year. Luis lives in the gym – he doesn’t take a day off. “We have prepared well for this fight, and he has been doing his due diligence. I will not be surprised when he wins. “Thank you to HBO for all that they do for boxing. Thank you to Golden Boy Promotions— everyone there is a great person and we have a wonderful relationship. “This is a big year for Top Rank. Bob Aram is celebrating his 50th year in boxing– Muhammad Ali, Marvin Hagler, Sugar Ray Leonard, Tommy Herns, Roberto Duran, Oscar De La Hoya, Manny Pacquiao, George Forman, and now here we are at Turning Stone Resort Casino for this very meaningful fight for us with Walters vs. Sosa. “It will be a tough battle with two tough stars and big stakes for the winner. “As they say, 130 lbs. is his territory. I am willing to fight at whatever weight. I had an excellent training camp in Panama. “Thank you to God; thanks to HBO for believing in me; thanks to Top Rank, Russell Peltz, and Golden Boy Promotions. Training camp has been great, and my game plan is excellent. I’m ready to give the fans what they want. “It is great to be here at Turning Stone Resort Casino and is a pleasure to work with Golden Boy Promotions, looking to go great things together. Thank you to HBO as well. This will be a spectacular show. “Thank you to God for giving me this moment. Thank you to my promoters, Star Boxing and Golden Boy Promotions and HBO for everything. “Thank you to God and thanks to HBO for trusting me. That is what I am here for, to give an exciting night. Thanks to SMS Promotions for having me here and to continue my promotional deals.